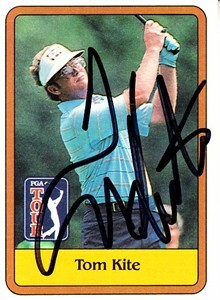 Tom Kite 1981 Donruss PGA Tour golf Rookie Card #20 autographed in black Sharpie. Obtained in person, with certificate of authenticity from AutographsForSale.com. About NrMt condition. ONLY ONE AVAILABLE FOR SALE.